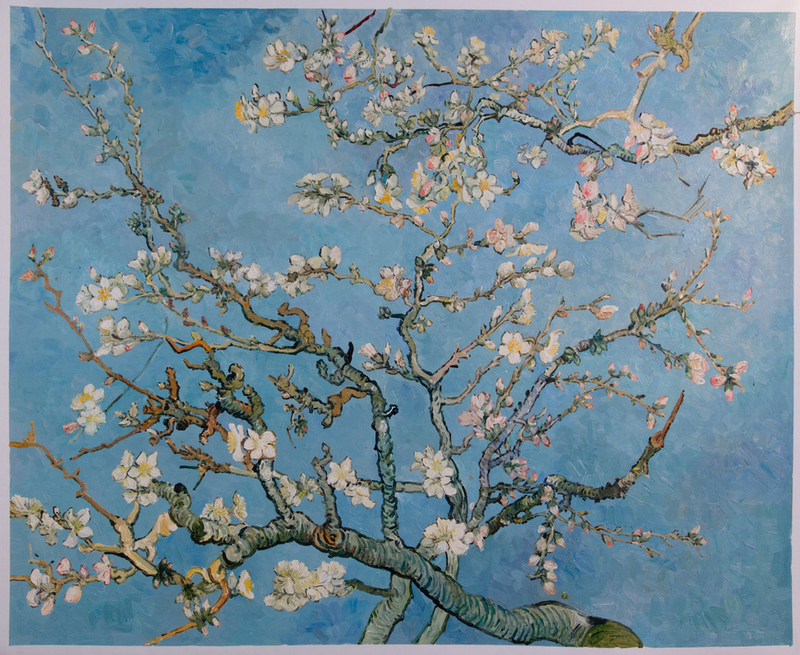 The Blossoming Almond Tree is one of Van Gogh’s most well-known paintings. Created in 1890 as Van Gogh was recovering at the Saint Paul Asylum in Saint-Remy in the south of France. Van Gogh was thrilled and set about marking this moment in time with a painting. The Blossoming Almond Tree was born. It is a painting that is full of hope, with it’s branches curling in front of a blue sky, the flowers too blooming. The tone of blue in this painting is remarkable; it jumps from the canvas and gives the painting a strong symbolic nature. The framing of just a section of the tree, and the bold outlines used share some of the ideas and techniques Van Gogh learnt from his love of Japanese art (which will be talked about in more detail in an upcoming post). It also was a great way to play with one of his favourite themes: rebirth. Trees blooming and flowering announces the beginning of spring and new life, and this is what Van Gogh wished for his new nephew, and perhaps more importantly for himself. After such a strong work, Van Gogh again fell down into bad health. He had hoped to continue to paint trees and plants in bloom, and perhaps make a series of these, but by the time he had recovered enough to pick up the brush, the season had changed. This then is the only one Van Gogh managed to paint in this style. The young Vincent, once grown up, went on to create the Van Gogh Museum, in Amsterdam. Get your oil-painted reproduction of the Blossoming Almond Tree here.